The Forum program is developed by a volunteer committee of NAEM members, who work together to identify the key issues facing EHS and sustainability managers today. The agenda features 24 learning sessions and three inspiring keynote presentations that deliver the actionable strategies you need to drive change in your organization. Avoid the lines, register and pick up materials on Tuesday! Join fellow attendees for a morning of golf at the Club de Golf Metropolitan Anjou in Montreal. The cost is $49 per person including golf cart, and golf club rentals are available for $25. Tee time is 10 a.m., and lunch is available on-site at the course bistro. Email Mike Mahanna at mike@naem.org to reserve a spot. This golfing event has SOLD OUT. Host Welcome: NAEM Executive Director, Carol Singer Neuvelt. CDP Introductory Remarks: Stephen Donofrio, Vice President of Partnerships & Innovation will provide an overview of CDP's work on corporate environmental disclosure in North America & recognition of climate change leaders & leadership best practices. Keynote: Stephanie Berger, Senior Manager of Corporate Responsibility and Environment at BCE Inc. (Bell Canada), a leading Montreal-based CDP discloser and Danielle Lussier, the Division Head of Service for Life Quality at Ville de Montréal, Division for Sustainable Development. There is no fee for this event but attendees must RSVP and space is limited. NAEM President Stephen Evanoff, Vice President of EHS; Danaher Corp.
Forum Co-Chair Kym Fawcett, Manager, Safety & Social Responsibility; Enerplus Corp.
Sea Level Rise is a critical leadership challenge facing us and our businesses. We are in a new era that is creating extraordinary crises as well as opportunities. As stewards of the environment and practitioners tasked with implementing sustainability visions at our company, we must grasp this challenge and begin a process of "Intelligent Adaptation." By doing this we can prepare our companies to reduce financial exposures, protects assets and ensure our ability to operate. 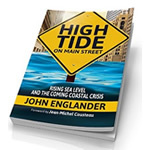 Drawing on historical geologic proof, and applying recent lessons from Super Storm Sandy, John Englander's presentation will illuminate why it's necessary for business to take a "long" view, help attendees assess their business risks, build the right foundation for adaptation, and advocate the importance of this issue to the C-Suite. Presented by: John Englander, Oceanographer & best selling author of "High Tide on Main Street: Rising Sea Level and the Coming Coastal Crisis"
Companies today are being challenged to look for opportunities that positively impact their business while also improving their sustainability performance or the performance of others. In this session you will learn techniques being applied by leading companies on how they are successfully aligning business and sustainability strategies that resonate with management. The changes being made are establishing them as transformational thought leaders in sustainability and driving improved return on investment. Geoff Boraston, Vice President Environmental Affairs; Granite Construction Inc. Rob Currie, Director Environment, Health & Safety; Baxter Healthcare Corp.
John Lovenburg, Vice President of Environmental; BNSF Railway Co.
Laura Scott, Manager Environmental Business; NRG Energy Inc. Effective internal EHS & Sustainability communication can make funding and staff for EHS programs easier, and establish you as a strategic business leader. This session will examine how EHS&S leaders are communicating and advancing EHS&S internally and "selling it to the business". Speakers will offer a view of their overall strategy as well as specific tactics and practices that have been most effective, things that haven't worked as well, and lessons learned to help those trying to build more support for and understanding of EHS&S efforts and priorities. Steve David, Manager of Air Strategy; The Mosaic Co.
Scott Stallard, Senior Manager, Environmental Sustainability; Lockheed Martin Corp.
Green House Gas (GHG) Management is a core part of EHS&S managers' responsibilities. Despite a universal regulatory requirement to limit emissions, many companies have moved ahead with programs and goals to ambitiously reduce their GHG footprints. This session will examine the latest developments on the regulatory front in both the US and Canada as well as explore how two North American companies have approached GHG management as a strategic issue for their organizations, what decisions and programs they've put in place and why these make sense for their business. Speakers will also offer insights for those who want to remain well positioned to meet new regulatory requirements and stakeholder expectations. William Archer, Director Global Sustainability; S.C. Johnson & Son Inc.
Michael Ford, Environmental Manager; Corning Inc. Cultural Change isn't achieved quickly or easily and for more complex organizations the challenge is magnified. EHS&S Managers are the primary agents charged with sustainable cultural transformation often with minimal staff and resources. Employee Ambassadors build a community of excellence within a company's workforce and serve as trusted stewards and guardians of the EHS&S culture. EHS&S agents are responsible for identifying and developing these ambassadors in an effort to ensure cultural change is implemented and maintained. This session will help attendees tackle this important challenge and provide methods to identify and engage EHS&S ambassadors. Take part in a short Ambassador training camp and hear success stories from your peers on how they've created effective EHS&S culture change. Gretchen Digby, CSM, Director, Global Education Initiatives; Center for Energy Efficiency & Sustainability; Ingersoll-Rand Inc.
Susan Roche Hendrix, Health, Safety and Quality Management Systems Manager; Fujifilm Manufacturing USA Inc.
How have companies successfully implemented meaningful energy management programs that get beyond the low hanging fruit? And what new innovations and tools are they using to get the next generation of energy savings. Attendees in this session will learn how speakers are taking their energy savings to the next level with specific tools and tactics as well as look at the overall strategy leading companies have put in place to drive down the road to ever greater energy saving. Joanne Howard, Energy Climate Strategy Manager; Deere & Co.
Brad Runda, Global Director, Energy; Koch Industries Inc.
A challenge for every business is assuring the right measures are in place to drive the desired behaviors and business performance. But, what are the right measures? Traditionally, many businesses have used lagging indicators to track EHS and Sustainability efforts. But, is this the best way to drive performance improvements? Attend this session and understand, "what is a leading indicator? Hear from companies on how they've developed leading indicators and strategic metrics that make sense for their business and how they are using these proactive measures to drive EHS and sustainability performance improvements. Leave the session with ideas for how to integrate leading indicators into your own operations and transition your metrics to achieve strategic outcomes. Michelle Garner-Janna, Director Corporate Health & Safety; Cummins Inc.
Ryan McMullan, Environmental, HazMat, & Safety Programs Administrator; Toyota Motor Sales U.S.A.Inc. Join a lively session on how companies are maintaining robust EHS compliance performance while reducing the cost of EHS programs. Since the advent of the great recession corporations have been driving down the cost of operations to remain competitive. Maintaining EHS compliance in its own right is as challenging as ever, made more so with diminished resources. Lean Manufacturing practices as well as efforts to streamline and simplify processes have allowed EHS professionals to discover improved methods for compliance assurance. Hear the methods and techniques being used by your peers and share your own tips and strategies. Andrea Fee-Blackberg, Global EHS Manager; Atkore International Holdings Inc.
Mitchell Mitgang, Director, Environment, Safety, Health & Security; ITT Corp.
Monty Lovejoy, Vice President, Global Sales Director, Manufacturing Sector; AECOM Technology Corp.
Building sustainability into an organizational culture is important to company business success but few companies understand where to start and how to embed this into employees' day-to-day jobs. Unlike other organizational initiatives, there are external factors that impact the way we address sustainability. Learn more about the growing need for this shift, the importance and the how-to's for embedding sustainability into your organization's culture. Attendees will also receive an effective tool for measuring their success and hear from a peer on how they are using this tool to drive continued culture change improvements. Jaime Solland, Advisor Corporate Responsibility; Cenovus Energy Inc. While EHS and Sustainability Managers are adept at managing qualitative risk, it is often challenging to measure and quantify risk and then translate the quantification into financial terms. This session will look at innovative ways to measure, manage and monetize key EHS and Sustainability risk to better align your efforts with core business objectives. Deborah Briggs, Director Environmental Compliance and Systems, Corporate EHS; Cargill Inc.
Megan Lum, Director, Environment, Distribution & Shared Services; Pacific Gas & Electric Co.
EHS and Sustainability managers are challenged to produce data intensive sustainability reports often with limited resources. How will they ensure that the report is accurate and credible? Should they seek third party sustainability report assurance or internally audit their reports? They also need to decide on the scope of their verification efforts and select an appropriate verification standard. This session will provide attendees with a look at the processes leading companies have gone through to make these decisions. It will include a discussion of the benefits of external data assurance as well as the challenges companies have encountered in the process. If you are publishing a sustainability or EHS report, attend this session and come away with a clear understanding of whether data verification and/or sustainability report assurance make good business sense for your company. Jennifer Grow, Communication Manager, Environment, Health and Safety; Baxter International Inc. Rob Meyers, Environmental Sustainability Director; PepsiCo Inc.
Sandy Nessing, Managing Director, Sustainability & ESH Strategy & Design; American Electric Power Co. Inc.
Lisa Barnes, Technical Director, Sustainability & Climate Change Services; Bureau Veritas S.A.
EHS and Sustainability Managers have a critical role to play in helping their organizations keep “product on the shelf” with regard to perceptions of product safety, emerging supply chain sustainability initiatives, grass roots toxic chemical movements and state regulations. This session will give attendees greater awareness of these issues and the role of EHS and Sustainability Managers in successfully addressing them and adding value to their organizations. Attendees will also leave with an update on key safer products and green chemistry supply chain initiatives and a look at tools being used to manage data and assess chemical hazards and risks and handle product safety issues. Mark Hause, Corporate Environmental Manager; DuPont Co.
James Badalati, Director of Recall and Retrieval; Stericycle Inc. Through the tumultuous times during and after a merger or acquisition, EHS managers are challenged to keep current programs and practices on track while integrating programs across new business units and cultures. The session will provide insight into how your peers are meeting challenges head-on, including: integrating EHS standards and management systems, identifying and incorporating the "best" legacy practices and programs, blending two distinct cultures, and investigating and improving sites with poor compliance history. And did we mention that you have to do this while maintaining your "day job"? Time is of the essence and attendees will hear what it takes to get back to business quickly and determine signs of success. Deb Geyer, Vice President, Environment Health and Safety; Stanley Black & Decker Inc.
Kent Hart, HSER Director, Due Diligence & Environmental Management; Honeywell International Inc.
Kimberly Jackson, EHS Director; Spectra Energy Corp.
Andy's groundbreaking work on culture change, employee engagement, leadership development and the role of human resources have created game changing possibilities for companies driving toward sustainability. He'll present new findings, fresh ideas and practical advice to attendees on how to design programs, embed practices and achieve measurable business results. After his remarks, Andy will invite several business leaders to join him on stage to respond, and to delve into details about their experiences. 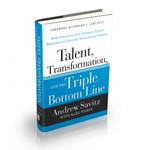 You will come away with ideas, strategies and tactics for leveraging your organization's culture, employee engagement, leadership development and talent management programs. Andrew Savitz, Sustainability pioneer, Thought leader and Best selling author of "Talent, Transformation and the Triple Bottom Line"
Bruno Sarda, Director Global Sustainability Operations; Dell Inc.
Companies are challenged to manage not only their operations, but also their supply chains and the full impacts of their products. Life cycle assessment is a tool that allows companies to understand a more complete picture of their environmental impacts, from raw material sourcing to disposal of their products. This session will provide examples of how companies have used LCA to inform business decisions and how they communicated what they learned in a way that allowed them to act on the information. Richard Ammendola, Senior Principal - Value & Sustainable Innovation; The Wm. Wrigley Jr. Co.
Stefanie Giese-Bogdan, Technical Manager; 3M Co.
Debbie Kalish, Program Manager, Center for Energy Efficiency & Sustainability, Ingersoll-Rand Inc.
Margaret Enos, Manager, Product Stewardship, Environment, Health & Safety; Baxter Healthcare Corp.
Is water critical to your business? Does your corporate water strategy address securing or maintaining water supplies to ensure production goals can be met? Are you working to put programs in place that utilize water efficiently by recycling or reusing it for other non-process applications? If you answered yes to any of these questions, be sure to attend this session and learn about methods being used by your peers to secure water supplies for the future, how they are reusing and recycling water from production sources and ways to conserve and improve water efficiency. David Chew, Director of Marketing and Sales; Fairmount Minerals Ltd.
Greg Koch, Director of Water Stewardship; The Coca-Cola Co.
Mark Johnson, Vice President, Corporate Sustainability Officer; Gannett Fleming Inc. Which EHS issues are dominating the regulatory agenda this year in Canada and the USA, and what can you expect in 2014? This session will help you identify regulatory developments and trends as well as find information on major proposed and final rules that may affect your business. The session will kick off with discussion with an overview of the key legislative, regulatory, and legal developments that occurred in 2013 and wrap up with what is coming up in 2014. Experts in their areas will talk about key air, water and energy/climate regulatory trends happening in the United States and Canada. Few of today's leaders in EHS and Sustainability have degrees in Occupational Health & Safety (OHS) or Environmental Management (EM), largely because those degrees did not exist 15 or more years ago. Yet today, the market is hot with young talent in these disciplines. What are they learning in these degree programs? What are their expectations? How do you retain them and train them to become tomorrow's leaders? This session will examine ways EHS leaders are addressing new employee recruitment and retention. Attendees will have a better feeling for what is taught in undergraduate OHS and EM programs, what young professionals expect from employers today, and how to turn those young professionals into future leaders in our profession. Sandra Stott, EH&S Program Development Manager, United Technologies Corp.
Vicky Will, Vice President, Power Environmental Services; Exelon Corp.
We are challenged to green our supply chains by influencing suppliers while not disrupting supply capacity. During this session, we will look at ways EHS and Sustainability managers can achieve this objective by discussing what data companies are gathering, how they are gathering the data, and how are they using it to make decisions. The session will offer examples of when and how measurable improvements in the supply chain have been achieved and the tactics and efforts employed by the speakers that allowed them to realize measurable success. Kristi Budzinski, Green Chemistry & BioPharma Project Manager; Genentech Inc.
Johanna Jobin, Director of Corporate Responsibility; EMD Millipore Corp.
As health and safety leaders, how do we get beyond the emphasis on measuring injury rates and focus on activities that lessen the potential for injuries to occur at all? This session will explore how a shift in emphasis that combines human factors, behavioral science and systems thinking can be applied to influence safe behaviors. Attendees will learn how two companies have developed their safety strategies around these principles, and applied them to their management systems and safety programs. They will share the results of these efforts and discuss how attendees drive change in their own H&S culture and take their safety programs to the next level. Robert Murphy, Vice President Safety, Health, Environment and Community; Sims Metal Management Ltd.
Wayne Pennycook, Senior Operations Health & Safety Advisor; Cenovus Energy Inc.
Today EHS and sustainability managers are challenged to complete more audits with less resources, combine compliance and management system audits, and manage other competing audit needs, all while keeping the quality and effectiveness of their audits at peak performance. This session will offer attendees strategies for keeping their programs fresh and effective including ideas for leveraging resources with other function audits and techniques to evaluate and improve the quality and value of an audit process. Come ready to share your ideas and techniques for how to tackle this critical and ever-present challenge. Peter Fisken, Vice President of Risk Advisory & Assurance Services; Carnival Corp.
Frank Marino, Corporate EHS Manager; Raytheon Co. Global companies have global EHS standards and practices that they want to implement consistently worldwide. But how do you find and build the EHS teams in countries and regions like China, India, the Middle East and South America to accomplish that goal? How important is it to be knowledgeable of cultural diversity and leverage it while still adhering to common standards? How do you create a collaborative environment rather than being the person from the home office? Hear from those with experience on tackling these challenges. Ann Condon, Director, Resource & Environmental Strategies; General Electric Co.
Helen Mei, Global EHS Leader; TE Connectivity Ltd.
Mark Stoler, Director, EHS Management; AECOM Technology Corp. Traditional EHS organizations tend to operate in the conventional world of internally driven metrics. But "high-performing" companies manage their EHS programs from a much wider organizational culture, process and data perspective. The objective of this interactive session is to discuss best practices and emerging trends within EHS that could be adopted by attendees to improve EHS performance and drive down the road to becoming ‘world class'. Hear first from "leading" companies and then engage one another to learn how your organization should change for the future. Topics for discussion will be focused on key elements of EHS performance including EHS strategy, policy, and programs; sustainability; environmental performance; health and safety performance; and external reporting. Phil McIntyre, Director of Business Development; Milliken & Co. Attend this interactive enactment of a company's efforts to prepare for the phase out of banned refrigerant R22. Through the scenario enactment, attendees will be able to explore the different concerns and stakeholders that will need to be addressed to meet this important regulatory requirement and continue business operations. Heather Foran, Assistant General Counsel, Ethics & Compliance; Ingersoll-Rand Inc.
Judi Kovacs, Vice President EHS & Corporate Supplier Social Responsibility Programs; NBCUniversal Inc. Leading businesses have been implementing and advancing sustainability programs for almost two decades so what is the collective impact of this effort? What does the future look like? Attend this lively session and explore the question, What is beyond sustainability as we currently know it? As a corporate leader, what macro forces will impact our world and our companies and how do we stay ahead of these? Attendees will explore emerging ideas like the golden triangle the blurring of the profit and nonprofit boundary and the idea of conscious capitalism. Come to this session and leave with big ideas that might lead to transformational thinking for your own organization. Samir Pathak, Environment and Sustainability Manager; The Coca-Cola Co.
Javier Rodriguez Merino, Global Senior Director, Sustainability Marketing; The Coca-Cola Co.
Join your colleagues in the heart of the Montreal nightlife district for this fun dinner and night out with jazz, cocktails and networking. Tickets are available at the registration desk. Meet in the hotel lobby to find a group to walk with, or to grab a shuttle bus to the event. Friday morning will offer attendees a variety of networking and learning activities including facilities tours, group outings to attractions in Montreal as well as onsite roundtable discussions and interactive learning sessions. These activies are open to all and included in your conference registration. The details and sign up will be announced in August. Seating will be limited and an RSVP will be required. Andy will lead a session for those interested in continuing the discussion from Thursday's Keynote Panel "Moving Forward - Culture, Engagement and Leadership Change." The world's most important management system standards on quality and the environment are in the process of being revised. This session, facilitated by the leader of the international negotiations on the ISO Environmental Management System standard, will give attendees a preview to new requirements being proposed for ISO 14001 and insight into the potential impact these changes will have on organizations that are using the standard, are certified to it, or are considering adoption it. Following up on the feedback and ideas provided during the session at NAEM's 20th Annual EH&S Management Conference in Naples, Florida this session will focus on formulating an action plan to elevate the status of the discipline. This will include the application of EH&S innovation and leadership that sets a new standard for business decision makers, gatekeepers, and power brokers across the global value chain. Topics from creating and sharing value at each step of the supply chain to attracting the best and brightest to the discipline will be discussed. The objective of this working group will be to begin the process of creating a road map that helps current and future EH&S managers achieve meaningful success in the profession of EH&S management. Join peers to discuss strategies for ensuring a smooth transition following a merger or acquisitions. Whether integrating programs and management systems or cultures, it's important that EHS leaders do a thoughtful job to ensure successful transitions. Tour this state of the art aeronautics facility and learn about their EHS management programs during this fun group outing to one Montreal's largest manufacturing companies. Because the facility is outside the city, the tour bus will depart from the hotel at 8 a.m. and return to the hotel by 11:30 a.m. This event has SOLD OUT. Space is limited and you must RSVP to mike@naem.org. Join this fascinating walking tour of the historical, contemporary and future St-Michel Environmental Complex (CESM) and TOHU's building in downtown Montreal. Originally a quarry and then a landfill, today the center has been taken over by the City of Montreal and transformed into a wonderful urban park complete with impressive limestone cliffs, over 5 km of walking paths and 48 acres of green space. The tour will include a history of the complex, and visits to the LEED GOLD certified La TOHU's building that hosts the National Circus School and Montreal sorting center. For more details on the center, please visit: http://tohu.ca/en/tohu-district/cesm/. To sign up, please email your full contact information to NAEMQuebec@aecom.com with the subject line, "sign up for NAEM walking tour." There is no fee for this tour. Visit this leading edge oil recovery facility in Saint Hyacinthe, Quebec. The recently completed facility will produce vacuum gas oil and other compounds from used crankcase oil for reuse by oil refineries and other industries. Because the facility is outside the city, the tour bus will depart from the hotel at 8 a.m. and return to the hotel by 11:30 a.m. Space is limited and you must RSVP to mike@naem.org if you'd like to join this tour with "Veolia Oil Recovery Tour" in the subject line. Meet the EHS leaders that make up the 2013 Forum Planning Committee. Are you an EHS or sustainability leader with a case study to share? Contact Virginia Hoekenga, NAEM Deputy Director, at virginia@naem.org or call (202) 986-6616 to learn about speaking opportunities.